In my world, a burrito is more than just a bunch of things wrapped up in a tortilla. There is a sincere thought process that goes into each and everyone I create. That’s not to say I’m above throwing a bunch of things inside a flour tortilla and calling it a day. I do that all the time – that’s what leftovers are for. I’m simply saying, that when I make a burrito, I think about every layer and how they will work with each other – most notably – will there be a balance? But also things like: Will it have too much acidity? Are there too many flavors fighting against eachother? Are there too few? These are the sort of things that keep me up at night. Granted, there are flavor combinations that are so ingrained (magical) that they’d work wrapped up together with an old shoe. But F’serious, how will we get passed what has already been codified and move forward the ideas of what should or shouldn’t be in a burrito? Am I perhaps, over thinking it? Should I just, I dunno, allow it to happen capriciously? When does a burrito cease being a burrito and become a – gasp – a wrap? There’s a lot of questions and its pretty apparent that I don’t have all the answers – It’s something I’ve touched on before. But, just because I don’t have all the answers doesn’t mean that I don’t think about it often enough to take note. And it doesn’t mean that I don’t just, yknow, try to put together flavors for the sake of seeing them wrapped in a flour tortilla. That is the basis of today’s burrito. I wanted to make a burrito that brought some of my favorite green ingredients together and see if they could, or would work. I’m pleased to say that after some investigation, we have a contender. I present the Green Burrito; Burrito Verde. 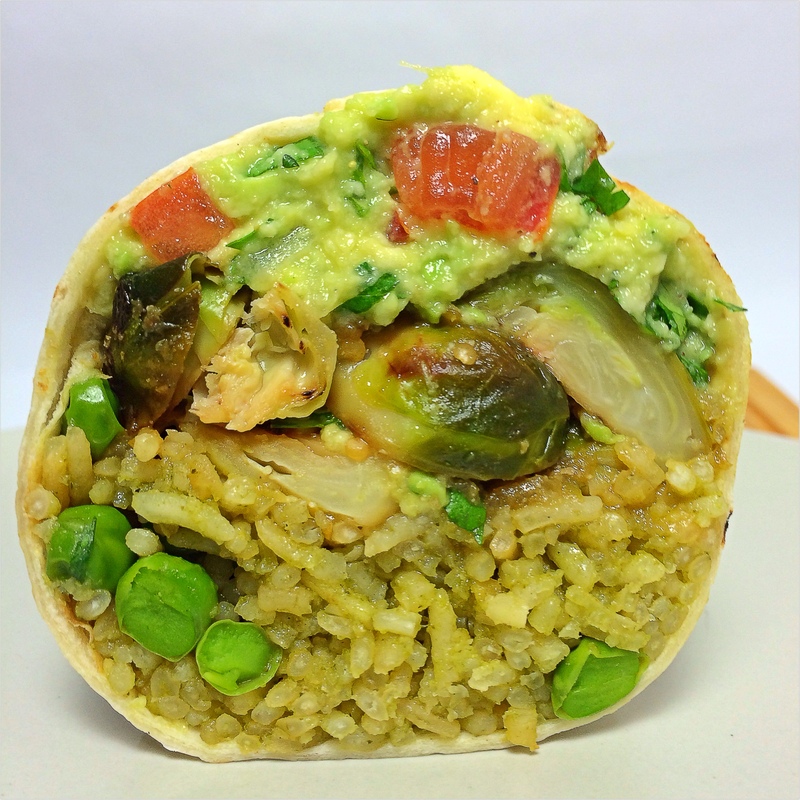 This is how this burrito breaks down: Blanched brussel sprouts (Green) are seared off then simmered in salsa verde (Green), paired with Roasted Poblano Rice (Uh, More Green) and finished off with Guacamole (Yup, Green). The burrito itself doesn’t require much other than the time to prep each of the components – It actually comes together pretty easy. If you want to skip a step, you can substitute the Roasted Poblano rice with brown rice. Obviously, the salsa verde can be store-bought just use something that you enjoy the flavor of. 1. In a stockpot bring 6 cups of water along with sugar and salt (stir to dissolve) to a boil. 2. Add your brussel sprouts, when the water comes back to a boil allow the brussel sprouts to blanch for 6 minutes. 3. From here you can either drain in a colander and rinse in cold water (to stop the cooking process) or shock in an ice bath (drained sprouts added to a bowl of ice water). I alternate between the two given how much ice I have on hand. They both work pretty well. 4. Allow to cool fully; pat dry with a paper towel (or clean towel). 5. Heat TBS Canola Oil in a large saute pan (Preferably rimmed) over high heat. 6. Add your (cooled) Brussel Sprouts and saute on high for 4 – 6 minutes, stirring intermittently until you achieve a decent (browning) char. 7. Add your salsa verde, the spices that follow and stir quickly to incorporate – lower heat to low. 8. Simmer until most of the liquid has cooked out. Serve in warm flour tortillas with Poblano Rice & Guacamole. And all is right in the world.